If you like Metro UI but donâ€™t have the enough resource to taste it, you may this free Windows 8 UX Pack. There are quite a few options out there if look hard but this one might be the best to use. 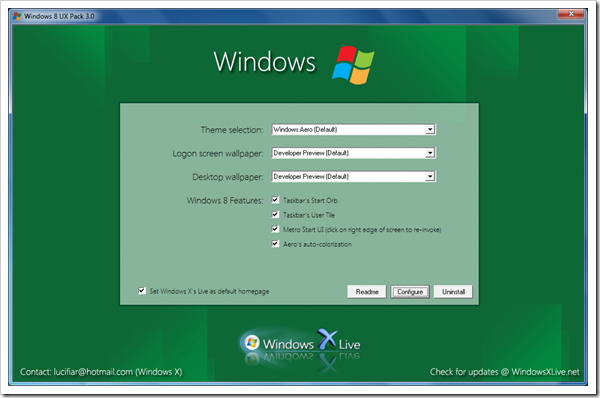 At least, it brings the Windows 8 User Experience without any modification done on your Windows 7 system files. Simply download the zip file from the website and extract the executable file to your desktop. And launch it. Select the options you want to have and click Configure. A few moments later, your Windows 7 turns to the look of Windows 8. Later on, if you are done with it, simply launch the program again and click Uninstall to remove it. Note that all tools out there that claim to make your Windows 7 look like Windows 8 wonâ€™t bring you the true experience of the next Windows. The feeling just wonâ€™t be the same. But, still, you at least give your Windows 7 another look that is fresh and compelling.